Thanksgiving is a day for food, family, and fun! 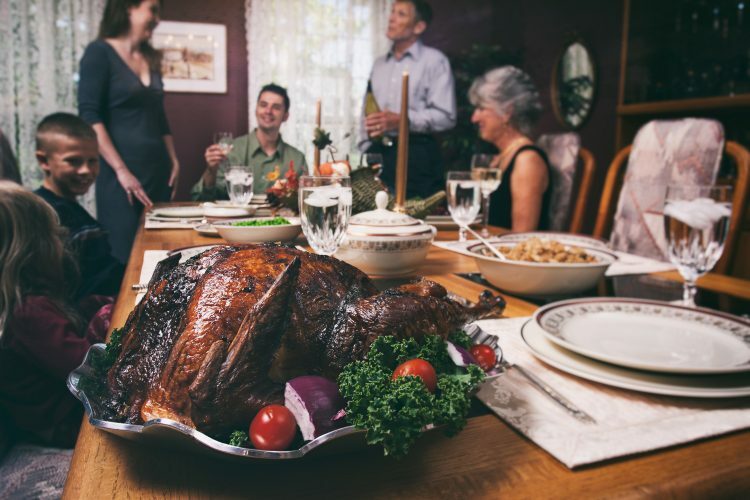 To make it easy for you, here are four fun and inexpensive Thanksgiving activities. They’re perfect for kids and adults. Do you remember the “Pin the Tail on the Donkey” game from birthday parties as a kid? This activity is a throwback to those good ol’ days. Start by drawing your turkey’s head and neck on the small piece of construction paper. Cut this out. Make a beak from the orange construction paper by cutting out a triangle. Make a waddle from the red construction paper and glue on the turkey’s chin. Draw eyes on your turkey. Make the turkey’s body by cutting a large circle from the large piece of construction paper. Glue the head and neck piece to the center of the circle, so it sticks up over the top. Add legs cut from the orange construction paper. Use the pencil to draw a feather shape on one of the pieces of paper. Cut it out. Use this as a template to create more feathers from each color. You’ll need one feather for each player. Attach your turkey to the wall with paint-friendly tape. Let each player pick a feather and write his or her name on it. Stick a small piece of double-sided tape to the back of each feather. Blindfold the first player, and have him or her to try and stick the feather in the correct spot. Let everyone take a turn and see who gets the closest. This activity is a great one to remember what Thanksgiving is all about. As your guests arrive, hand them each a strip of paper and a pen. Ask them to write down what they are thankful for. Once they’ve finished, fold their paper and stick it into a jar. Collect a thankful strip from everyone. You can scribe for young children if necessary. Before you begin eating, when everyone is in a common area, bring out the thankfulness jar. Draw one strip and read it aloud. Ask your guests to guess who wrote the strip. Continue reading and guessing until the jar is empty. Bring out your fall or winter themed jigsaw puzzles for this activity. It’s best to set the puzzles up in a corner of the room where a couple of people can gather together. You’ll want to set out one puzzle at a time, carefully spreading the pieces around a small table. Prop the box up so everyone can see what the completed puzzle should look like. Invite your guests to add some pieces to the puzzle throughout the day. See if you can work together to complete it before it’s time to leave. With a bit of butcher paper and some basic art supplies, you can create a unique banner to display throughout the holiday. Pick a wall that has some empty space, and tape a large piece of butcher paper to it. Use a marker to write, “Happy Thanksgiving!” in large, block letters on the banner. Set out markers, crayons, and any other art supplies you’d like on a nearby end table. Invite each of your guests to add to the banner. They can simply sign their name, or they can add an elaborate drawing. Remember to take a picture of your banner before you take it down. If you do this annually, you can display your pictures of years’ past to inspire guests and remind them of past Thanksgivings. Pick up what you need with iRazoo Points! Don’t spend money out of pocket for these activities. Use gift cards earned with iRazoo points to buy everything you need for these fun and inexpensive Thanksgiving activities.